On my way to work this Thursday morning, I saw Carven cresting the top of the 10th Avenue I-95 overpass. The fixed-gear tricycle he was on looked pretty beat-up but the trailer he was pulling is what really grabbed my attention. 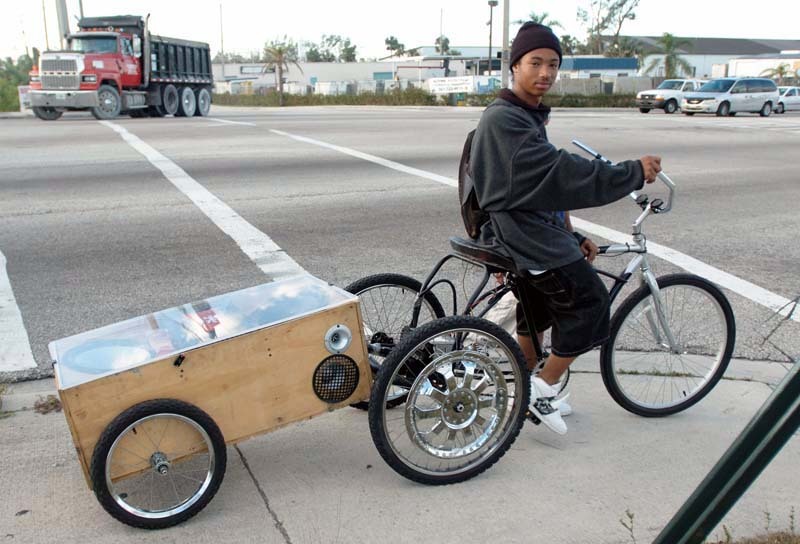 His low-riding plywood trailer had two 12-volt car batteries, an audio amplifier, two subwoofers, two mid-range speakers and a pair of tweeters all connected to a Kenwood car stereo. The batteries alone must have weighed in at more than 50 pounds. Toss in what looks to be half a sheet of half-inch plywood and you’ve got another 15 pounds. 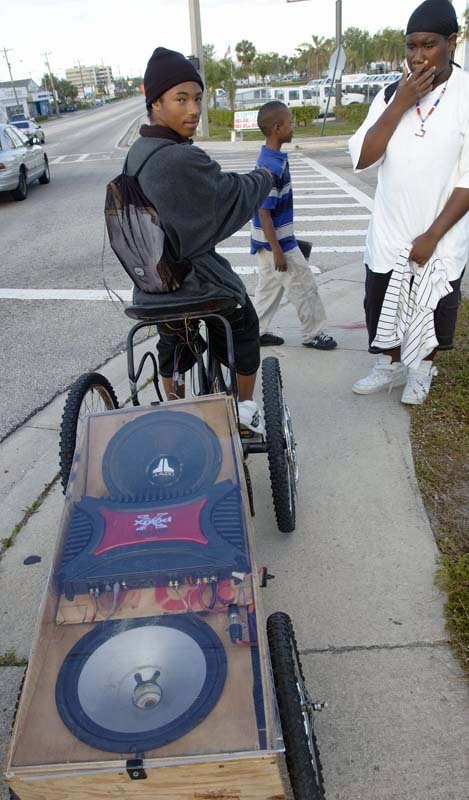 One of the trike’s wheels had a spinner. The other drive wheel used to have a spinner but it fell off and he hadn’t yet put it back on. Even better, he had dual bicycle bells on the front chopper-style handlebars. You don’t get any flashier than that. I couldn’t resist. I parked at the bottom of the overpass, jumped out with my camera and took a few pictures. Carven was proud of his ride and didn’t mind at all. He did think it odd that some guy in a tie stopped him on the side of the road. I told Carven I was really impressed by the engineering but moreso his legs. All in, his full rig must have topped a hundred pounds or nearly six and half Trek Madones. No weight wennie there, that’s for sure. After not more than a couple minutes, he left for school and I left for work. As he rode off, one of his buddies hopped on the back as though Carven was driving a taxi and caught a ride to school. If I see Carven again, I hope it is in my rear view mirror, briefly, as he passes my bike on the road. I love that! What a great device, that’s a sure way to get fit.